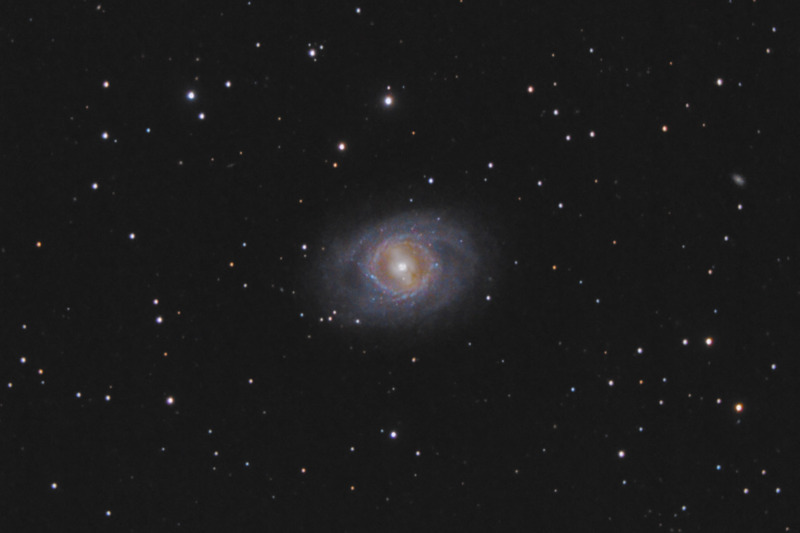 M95 is ringed-barred spiral galaxy in the constellation of Leo. It is one of the members of the Leo I galactic group which includes prominent members M96 and M105. The group of galaxies is relatively nearby at 30 million light years and has been instrumental in helping astronomers to calibrate the distance scale of the universe. M95 has two rings surrounding its barred nucleus. The outer ring has a large number of of HII regions and areas of star formation activity (activity which is believed to be triggered by supernovae explosions). At approximately 20:00 UTC on March 16, 2012, Italian astronomers discovered one of these stars in the outer ring had exploded in an enormous supernova explosion (SN 2012aw). At the time of discovery, the supernova was shining at magnitude 17, but it reached magnitude 13 within 24 hours (a 40 fold increase in brightness). As it happens, I had photographed M95 on the night of March 14-15. This image was taken between 4:00 UTC and 8:00 UTC on March 15, 2012. As such, it precedes the supernova explosion discovery by only 36 hours. Close, but no cigar! In this image, North is to the left. This image is cropped to 43% of the original full frame. Software Used Images Plus 4.5 for camera control, calibration, stacking, digital development, Lucy-Richardson deconvolution, multiresolution sharpening, smoothing and noise reduction. Photoshop CS5 used for levels and curves, color balance, high pass filter, star shrinking, saturation adjustments, sharpening and noise reduction. Gradient Xterminator for gradient removal. Carboni Tools for additional saturation adjustments, noise reduction, and smoothing. HLVG for additional color correction. Notes I would have preferred to photograph this galaxy for longer than 2 1/2 hours. However, because of the supernova explosion, I didn't want to mix my pre-supernova images with any post-supernova images. As such, this image is noiser than I wanted. However, I was able to retain some fine detail, and the image also has a few nice faint background galaxies.